COLORFUL OASIS IN THE DESERT: IMPERIAL NATL. 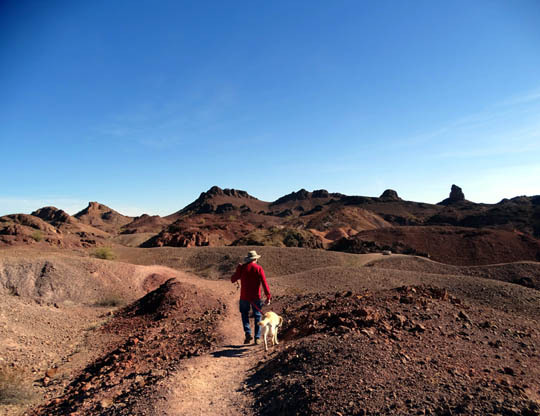 are a green oasis, contrasting with the surrounding desert mountains." The Department of the Interior's Fish & Wildlife Service administers 550 wildlife refuges around the country. The mission is to conserve fish and wildlife and their habitat. All or most of the refuges are free to enter and some allow camping. 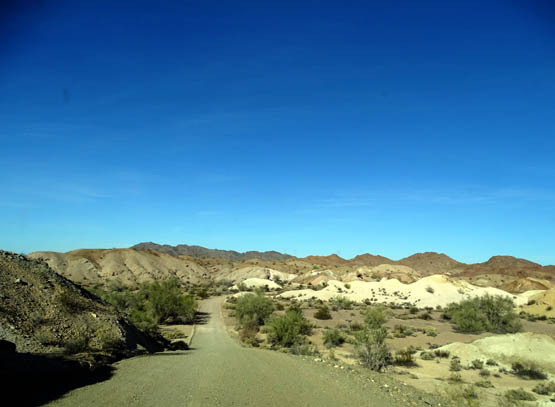 On a beautiful sunny day in December we decided to drive up to the nearby Imperial National Wildlife Refuge with the dogs. 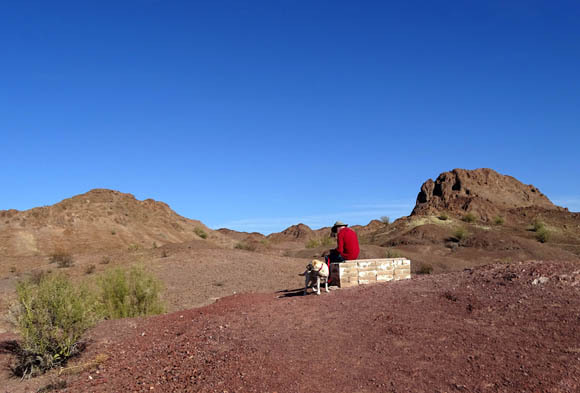 Four years ago we hiked the Painted Desert Trail with Cody but we didn't spend much time in the rest of the refuge. 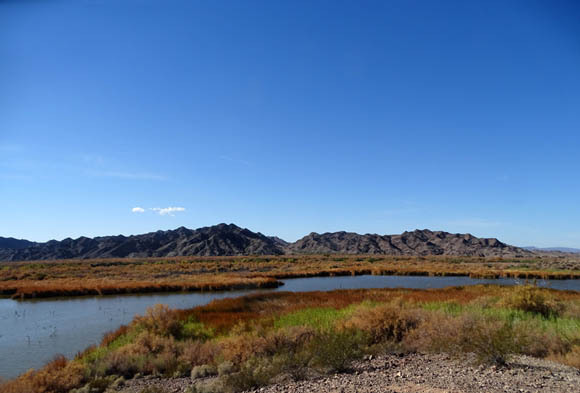 Imperial NWR is one of two large national wildlife refuges adjacent to the northern part of the sprawling Yuma Proving Ground Army base. 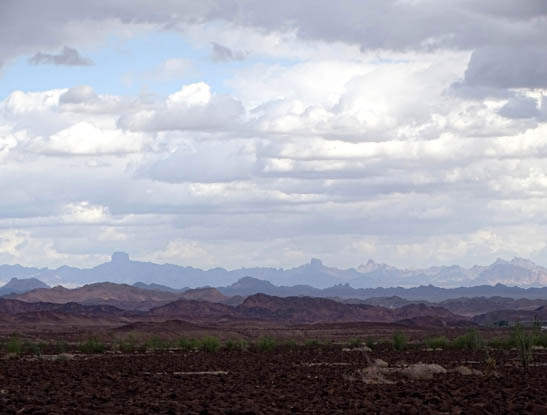 Kofa NWR is humongous at 665,400 acres. We didn't visit it until February so I'll show photos from it in the 2016 journal. 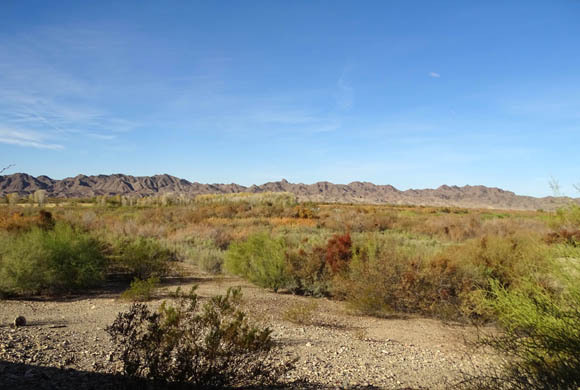 Imperial NWR is much smaller at "only" 25,768 acres but it's a more manageable size to negotiate and I liked it better because it is strung out along the Colorado River. 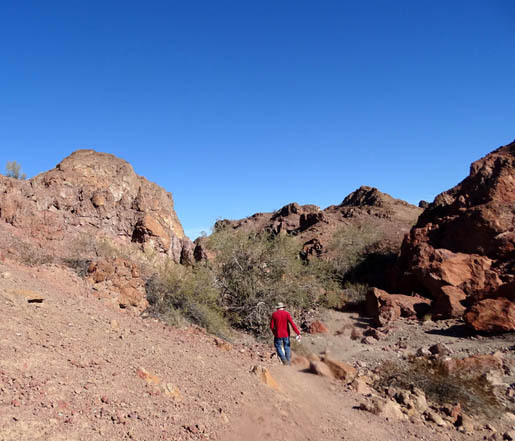 It is more green and colorful than the predominantly barren terrain I saw at the Kofa NWR. 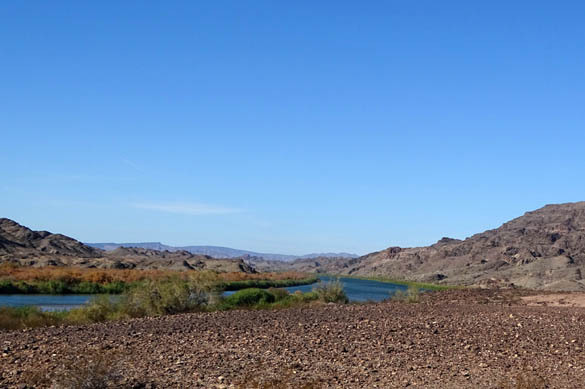 Most of the land at Imperial NWR is on the Arizona side of the river. The visitor center, trails, overlooks, and the only road going into it, Red Cloud Mine Road, are also on that side. More than 15,000 acres of the refuge are federally designated wilderness that can't be developed. 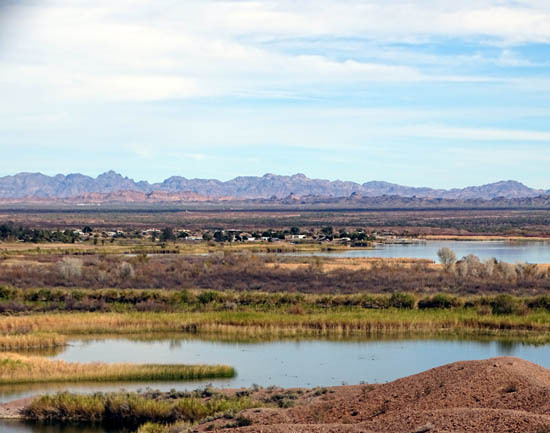 At the northern edge of the Sonoran Desert, this refuge includes upland desert habitat, marshes, and Colorado River backwaters. Wetland wildlife is most abundant during the winter. The original "snowbirds" -- ducks, geese, shorebirds, other water birds, hummingbirds, and song birds -- flock to the lower Colorado River to stay warm, just like humans do. It's a great birding area. At least 275 species of birds have been observed on the refuge. 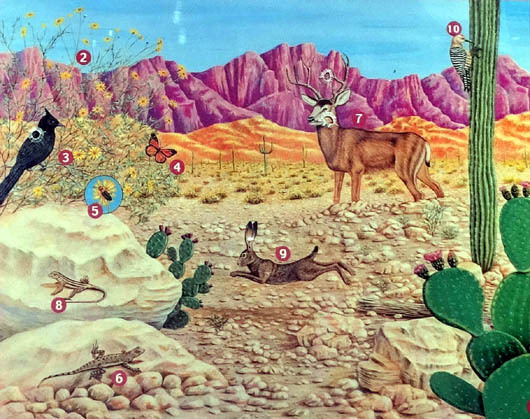 Many reptiles and mammals live here year-round, including desert bighorn sheep, mule deer, mountain lions, bobcats, coyotes, gray fox, jackrabbits, raccoons, squirrels, lizards, and snakes. Feral horses and burros are not part of the natural ecosystem -- they were introduced years ago by humans -- and sometimes create problems for native wildlife species. 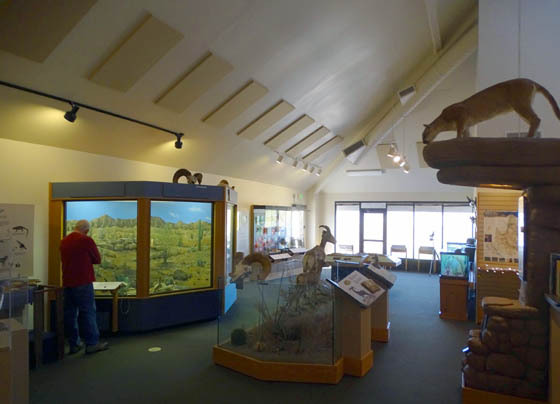 Popular activities include watching and photographing wildlife and the scenery, hiking the Painted Desert Trail, driving the hilly dirt road to the observation points, looking at the exhibits at the visitor center, picnicking, boating, fishing, hunting, and horseback riding. 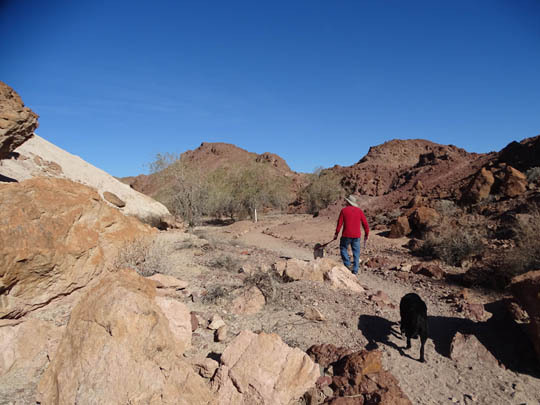 Leashed dogs and those "under voice control" are allowed in the refuge. Camping is not. We had already picked up a brochure with information and maps for the wildlife refuge so we knew where to go from our RV park on base -- east on Imperial Dam Rd., north on US 95 to approximately MM 46, west on Martinez Lake Road through the Proving Ground for ten miles, then north on Red Cloud Mine Rd. for a few miles to the visitor center. We drove around town to see what was there. For future reference we checked out the small military campground, a private campground, and an area where boondockers can camp on public land. It's a good place for folks who like to fish and/or boat but for this winter we'll remain at Desert Breeze RV Park on base. This 1.3-mile loop is easy to follow as it winds through hilly terrain but it has some steep spots and a few steps. 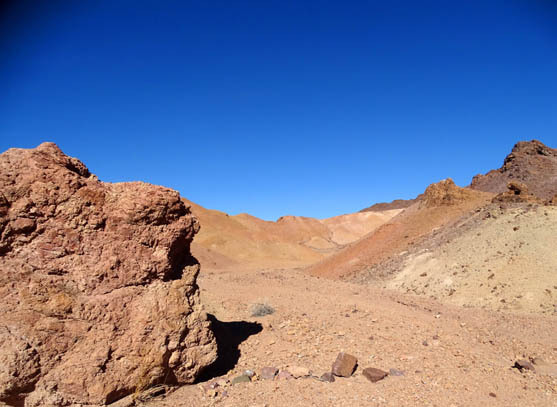 It takes hikers past the most colorful volcanic rocks in the refuge. 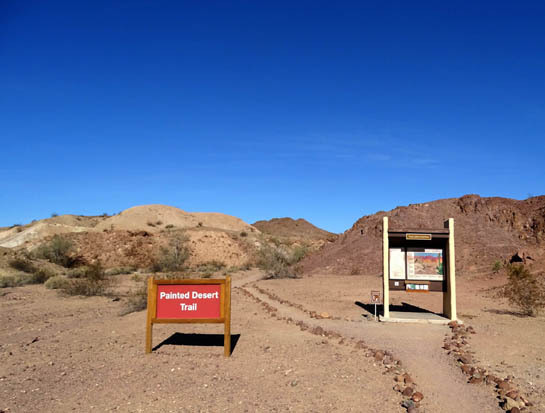 Hiking and horseback riding are allowed in the wilderness areas of the refuge but this is one of only two established foot trails. 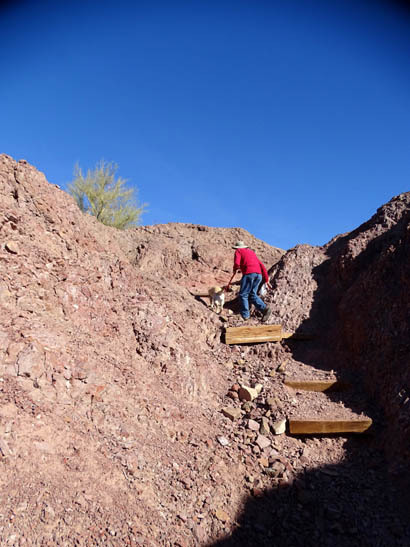 The other one is the shorter path to the observation deck near the visitor center. Bicycles and all motorized vehicles can ride only on roads. 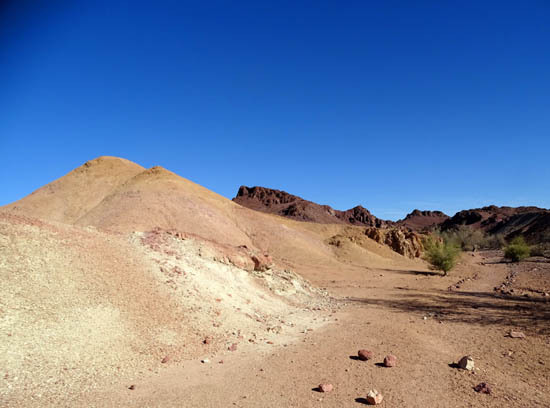 The terrain is interesting but less impressive to us than it was four years ago since we spent so much time recently in Red Canyon and Bryce Canyon. They are hard to beat for colorful rocks! 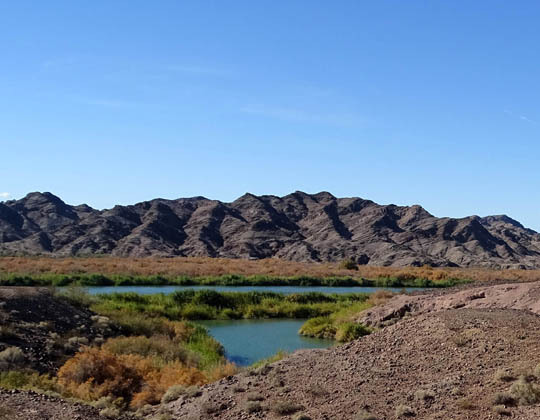 Although the wildlife refuge has a lot of green trees, shrubs, and grasses along the river, its desert scenery can't compare with those vibrant Utah canyons and cliffs -- but it's more colorful than the LTVA and Laguna Conservation Area, so it's well worth a visit when we're in the Yuma area. After hiking we drove a couple miles farther back Red Cloud Mine Rd. in the Odyssey minivan to the Smoke Tree Overlook, which a woman at the visitor center had told us has the best views down to the Colorado River. 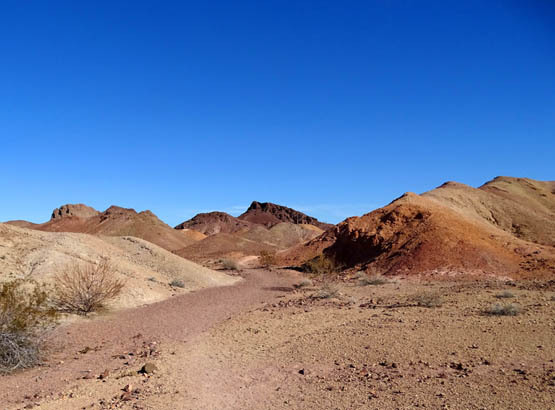 She said that although the dirt and gravel road isn't as wide or smooth as the first part to the Painted Desert Trail, we should be able to drive it that day in our 2WD car with care. 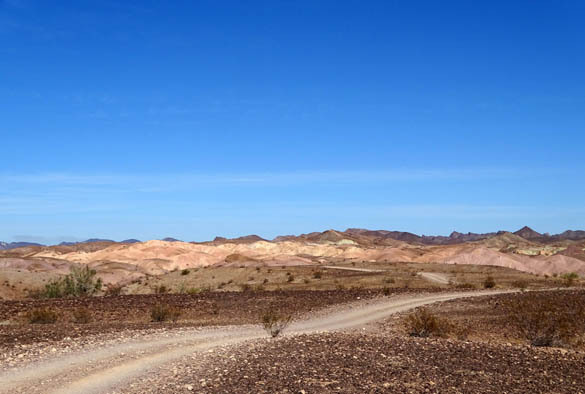 After a rain, 4WD is highly recommended past the Painted Desert parking area. The road wasn't so bad, even though it is "primitive" and not as wide or maintained as well as the first part of the road. Since it hadn't rained in about six weeks it wasn't slick or washed out. Jim did a good job driving up and down the steep, short hills, over small rocks, and around sharp curves. Luckily we met only one other vehicle on the narrow part of the road and there was room for us to pass each other going very slowly. When we were in the visitor center that morning Jim noticed a sign in the restroom announcing two photo workshops in January and February. 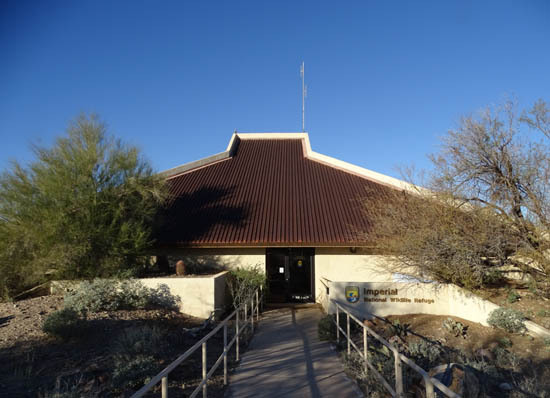 As we were leaving the refuge we stopped back at the visitor center so I could sign up for the January workshop. 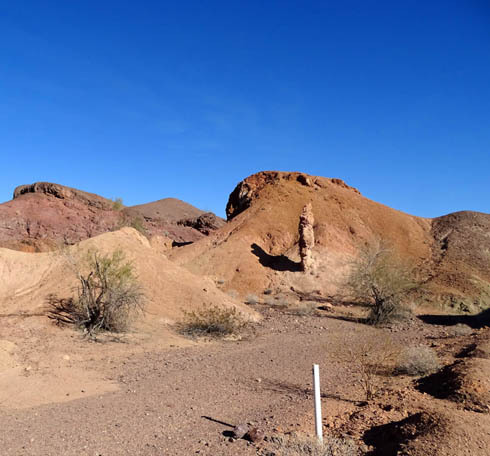 I'll have more photos of the refuge in the 2016 journal, from both the Arizona and California sides.